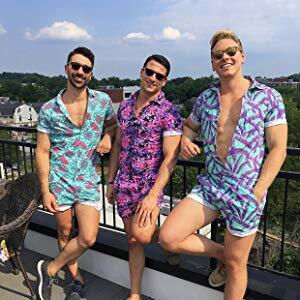 Guys in rompers is officially "a thing" and I'm here for it. My obsession with rompers plays a close second, only to my obsession with jeans (at last count, I own over 100 pairs, but who’s counting?) 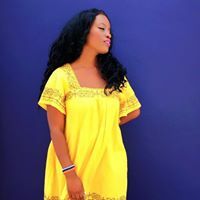 Rompers are, in my opinion style staples, as they are super convenient to pack for vacation, versatile (can often be dressed up or down) and obviously easy to wear. Rompers are the best, right?! So WHY the hate the men's romper trend? Rompers are generally my go-to look, because much like dresses, I consider them to be “complete outfits.” I can always depend on a good romper to come through in the clutch! Depending on the outing, or type of event I’m attending, I may or may not have the time or patience to bother with pairing blouses with pants or shirts with skirts. I usually spend about 2 or more hours preparing to leave my house, thanks to the time I dedicate to long, hot showers, belting out my Janelle Monae songs, extended vlogger-esque hair and makeup sessions in the mirror, and anywhere between 5-10 outfit changes. This, my friends, is why rompers are very necessary. I can slip on an in vogue (or vintage) romper and dress it up or down with ease. Yesterday’s Kickstarter brand launch of the latest trend in modern menswear, The RompHim™ incited a laughable, and quite entertaining virtual firestorm. 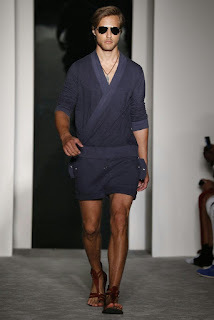 The Internet’s response was hilariously fascinating, abounding with LOL-worthy tweets, countless jocular memes featuring men in rompers romphims, and a jillion think pieces dedicated to the menswear look à la mode. As entertaining as it all was/is, I don’t understand why so many people are opposed to the look. I love it! They seem ideal for summer fun; festivals, rooftop parties, and dare I say it: dates! To be honest, men’s rompers are nothing new. Levis, along with many other brands have been designing men’s rompers (also called overalls & coveralls) for decades for necessity and style (let's not forget the infamous mechanic all-in-one). Zara, H&M and ASOS currently sell men’s jumpsuits, as well as high-end designers like Rick Owens, Vivienne Westwood, and Versace. With more than $160,000 pledged, far exceeding the initial $10k goal, The RompHim™ is slated to be the menswear breakout star of the summer. Guys, will you rock the latest menswear craze? Ladies: Is it a “Yaaaas” for guys in rompers or “Hell no”? If you show up for a date and the guy is wearing a romper, are you sneaking a pic to share with your friends for laughs & calling an Uber, or you snapping Insta pics to show everyone your guy is up on the latest trend? LOL I'm not against it, but I need it to hit mid thigh or be pants length LOL. Also, your rompers in that collage are ALL gorgeous. I especially like the striped one! Glad to know you're open-minded about it, bc from what I see, many aren't. Thanks SO much! The striped one is from Free People! They're really cool looking. I'm not sure if my husband will be into it though. Perhaps the more fashion forward gentlemen will. I'm actually pretty down for this trend, especially if the guy has some nice yams lol! I'm anxious to see where this trend goes and if Texas men are down for it ! I'm all in for guys in rompers if they have the bod to pull it off! Not sure my man does though...and I'm pretty sure his opinion would be OH HECK NO!!! I don't look good in them either unfortunately! I feel like there's a specific kind of guy that will wear it - they're definitely not for everyone. But for good for guys; they finally have more options! I'm so not against it but my husband says it's a "No, they are too short and just..no." I think I could sway him if he tried it on though because we are at the beach constantly. To me these scream comfy, airy, beach attire!